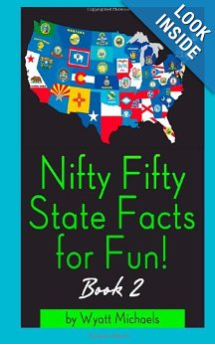 This is the second in a series making learning about the fifty states fun and informative. Rather than presenting a list of state capitols, symbols and associations, Michaels assembles trivia and facts in game format. In each case, the question is posed with three possible choices. The reader is asked to choose the correct answer. If you are wrong, you are given the opportunity to make another choice. In many cases, the reader is given a hint to help make a decision. There are many where questions. For example: Where is Mount Rushmore? ; Where did the sundae begin? ;Where was the birthplace of the first TV? A lot of questions involve firsts: the first state to vote for independence, the first National Park, the first state to make laws for cars, the first celebration of Memorial Day, and the location of the first public zoo. Another group of questions deal with the longest and the largest. These include the longest running radio station, longest floating bridge, longest sky way bridge, the largest gold producing state, and largest cable bridge. Then there are the facts dealing with unique situations. Which state was the birthplace of four presidents? Which state holds the world record for most rainfall in a 24 hour period? What is the name of the state which turned down hosting the Olympics? Name the state that has a floating post office. From which state do the names on the Monopoly game board originate? Whose state flag was designed by a teenager? What governor has a state named after him even though he never set foot in that state? This book makes a great activity for children on a long car ride. Much better than name the license plate. Children and adults will also learn some useful information to use as conversation starters. The game provides a quick reference source. There are maps and photographs that will enhance geographical knowledge as well. So if you are going on a road trip or want a new book to place on your coffee table, you might want to consider this quick read. If you enjoyed reading this post, please subscribe by clicking on the word Follow or hit the orange RSS feed button in the top right hand corner.